Profiled in our enterprising women feature last month, Grace gave Lesbian.com an exclusive sneak peek at her new book and it’s introductory Kindle price of $5.99 plus a free online training course, “Defining Your LGBT Target Market” (value: $97). Details. The primary objective of this book is to help you better understand who the lesbian, gay, bisexual, and transgender (LGBT) community is and how to effectively communicate to people within it. I encourage you to use the materials in this book as your beginners guide to appropriately communicating within the LGBT community. I share anecdotes, personal stories and tips I’ve learned along the way in my eight years of working with the community. 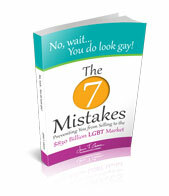 The intention of this book is to provide you with the correct approach to doing business with the LGBT community. You will see many recurring themes throughout, such as how important it is for you to understand why the community is important to you and how you can parlay that knowledge into your marketing messages; being able to admit when you’ve said something inappropriate, apologize for it and move on; and finally, if you are going to do this, you must be authentic and transparent. All of the money in the world will not buy you the trust of the LGBT community, which is the key ingredient to a successful marketing outreach plan. Whether you are a business owner who is an ally to the community or you are LGBT yourself, you will find something of value in this book. The stories, advice and guidance within this book stem from personal experience and one-on-one interactions I’ve had with people over the last eight years, many of whom would likely be your target audience. There is no one-size-fits-all approach when it comes to the LGBT community, which you will quickly learn. Because of this, you may find different avenues to success in your business. If you do, hurray! I hope you’ll consider sharing your success stories with me by e-mailing me at jenn@jenntgrace.com. I do this work for you, so I truly hope you enjoy this book. Happy reading! Have you ever sat back and wondered why we, as a society, feel the need to put labels on ourselves or put our identities into a box? I really began thinking about this when avid readers of my blog started to ask me if I knew how to market specifically to lesbians. When companies or individuals decide they want to market their products or services to the lesbian, gay, bisexual and transgender (LGBT) community, it is all too common that what they really mean is they want to market to affluent gay white men. Throughout this book you will see that the LGBT community is quite a diverse group of people who happen to fall under one umbrella term of gay or more broadly, LGBT. Since my readers have been asking me “Where are the lesbians and how can I reach them?” I’ve been on a quest to find an answer. Your very first and possibly most important take away from this book is that the LGBT community is not monolithic. What you will soon find out is that the LGBT community is not a large mass of people but rather a mosaic of individuals within an expansive, diverse community. Learn more about the book and Jenn T. Grace at her website. Posted August 19th, 2014 & filed under Money.